. :: SUN SHINES FOR OPENING DAY OF ROYAL WINDSOR HORSE SHOW ::. 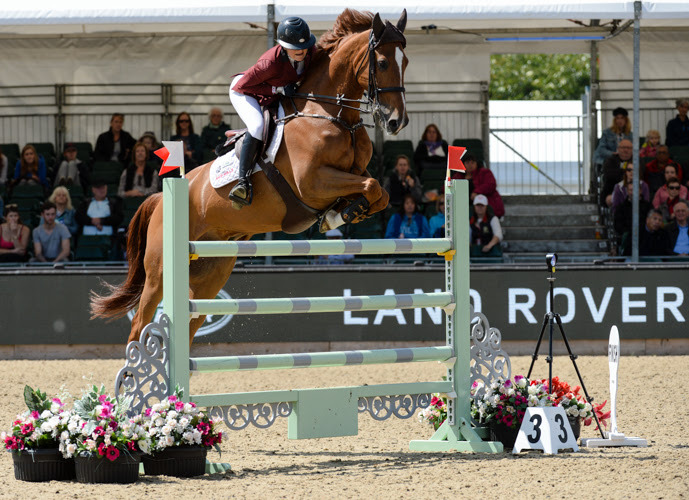 It was glorious sunshine for the opening day of Royal Windsor Horse Show, as spectators were treated to an array of top equine sport and entertainment. Her Majesty The Queen was present to watch one of her top horses, Tower Bridge, compete in the Cuddy Heavy Weight Hunter Class. The chestnut gelding, who was bred by Her Majesty, was ridden by Katie Jerram and came second in the class. Local rider Jayne Ross hit a purple patch, winning all three Hunter Weight classes, and taking her first Royal Windsor Horse Show Open Hunter title. Her victorious ride was the heavyweight winner, Bloomfield Excelsior, who stood above HM The Queen’s Tower Bridge, in second place. Ross also claimed the coveted Novice title having won that heavyweight division with another Irish bred gelding, Bloomfield Valhalla. However, her reign in the Alan Ross Ladies Hunter class came to an end when she was pipped by current national side saddle of the year rider, Esther Rostron on Seabourne Silent Valley. The Amateur Hunter title went to Olivia Edmondson with Raine Harthem’s lightweight victor, Winterhill Woodpecker. 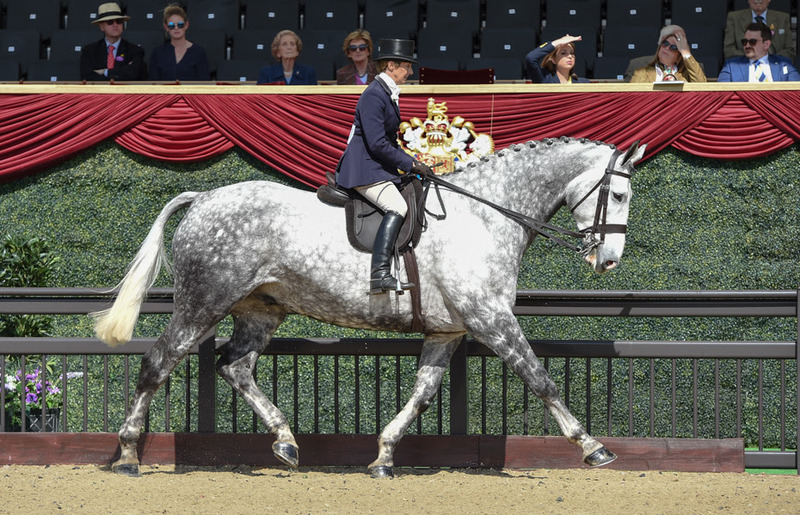 Dressage at Royal Windsor Horse Show kicked off today with the national Advanced Medium Freestyle to Music. The class proved a comfortable win for Winchester-based Kate Smith and her own chestnut gelding De La Veiga. It was not only a first prize at Windsor for Kate but a first competitive appearance at the venue also. "Wow. I loved competing in that arena - what an experience," said a happy Kate who gained high artistic marks for her programme set to music from Coldplay. De La Veiga is another horse by the influential and popular formerly British-based stallion DiMaggio and was bred by Sarah Oppenheimer whose daughter Alice won the same class here last year. "I have ridden a lot of DiMaggio's offspring and my last one was also out of a Weltmeyer mare as is De La Vega," said Kate. DiMaggio was also the sire of the second placed horse Daganay ridden by Suzanne Lavandera who used to own and ride DiMaggio, with who she won the world young horse championship in 2000. Daganay, a black nine-year-old stallion owned by Janet Gee since a foal, showed lovely extended trot and half passes. He was bred by Suzanne and is also out of a Weltmeyer mare. "Hopefully this is the one to bring me back to Grand Prix," said Suzanne who last competed here more years ago than she cared to remember and won here with her former ride Keystone Favoriet. Nikki Crisp and the Dutch-bred stallion Durable took third place. Framed by the most spectacular backdrop on the British Show Jumping circuit, the Land Rover Grades A and B Competition kicked off the week's Show Jumping classes. British rider, Georgia Tame and her gelding Acoustik Solo Du Baloubet claimed the title after producing a stunning round in 33.19 secs. The course, set in the Castle Arena, proved tricky with only 14 of the 37 competitors moving into the second phase. Olympic Gold Medallist, Laura Kraut (USA), set the pace aboard her eight-year-old, Caelle, finishing in 36.13 secs, but it was only fast enough to secure third place with Keith Doyle and Harlequin Dunraven taking second place. Aofie O'Connor and Billy Du Montois were victorious in the prestigious Walwyn Novice Jumping Championship following a thrilling round in 42.95 secs. Spectators were treated to a spectacular competition with only one second separating the top three. Sally Goding came a close second to O'Connor in the time of 43.29 secs with Jay Halim finishing in touching distance, 43.39 secs to take third place. 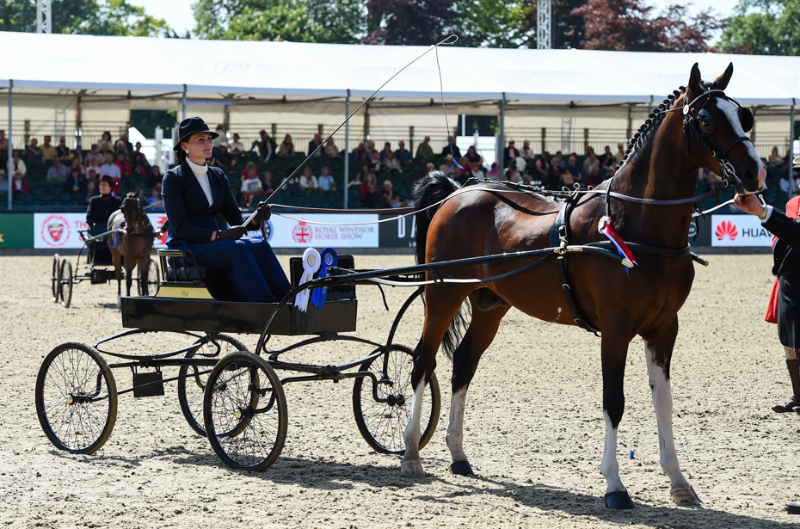 The full programme of driving classes at Royal Windsor Horse Show began with four Hackney in wagon classes followed by a Championship - a title much coveted among Hackney horse and pony exhibitors. 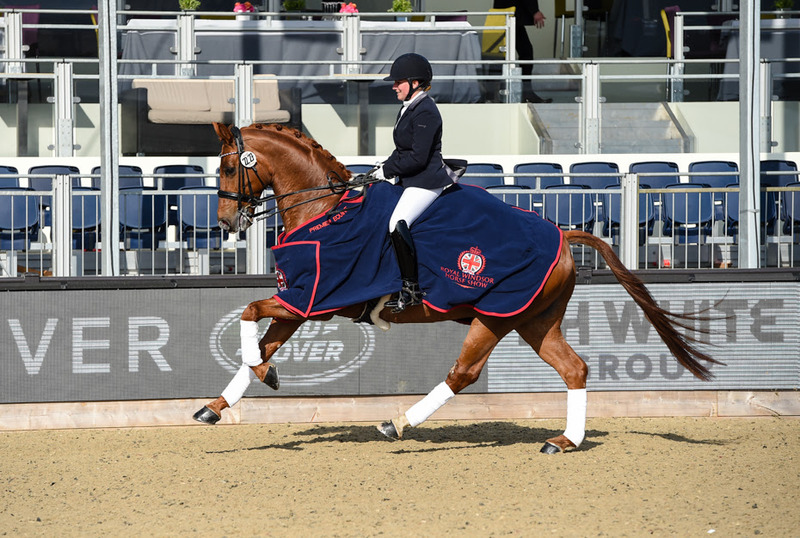 The winner of the Open Horse class, Sam Van Semerang, owned and exhibited by Mark Hardy, was knocked down in the Championship when Hayley McNiece’s Baldwins A Class Act responded to the scope and atmosphere of the large Castle Arena, upping his game to take top honours. The stunning 11-year-old stallion by Baldwins Go Johnny Go was the 2015 Hackney Harness Horse of the Year and the 2016 National Harness Horse Champion. Reserve placing went to Billy Ward with the Ward family’s homebred pony, five-year-old Luddington My Way; he won the open pony class having stepped up from novice only this year. For those unable to attend the Show, a 30 minute highlights programme, broadcast from the Horse Show, will be shown at 8pm on Friday 12th May on ITV1. Highlights from the Show will also be available on Sky Sports and Horse & Country TV. Furthermore, much of the top-class action on display throughout the week will be available to view worldwide via the Show’s live streaming service. Tickets are still available for Thursday, Friday, Saturday and Sunday and can be purchased at www.rwhs.co.uk or by telephoning the box office on 0844 581 4960 from the UK and +44 (0)121 7966290 internationally. Local residents can purchase tickets by contacting Windsor Information Centre on 01753 743589.